Polaris Arctic expedition. 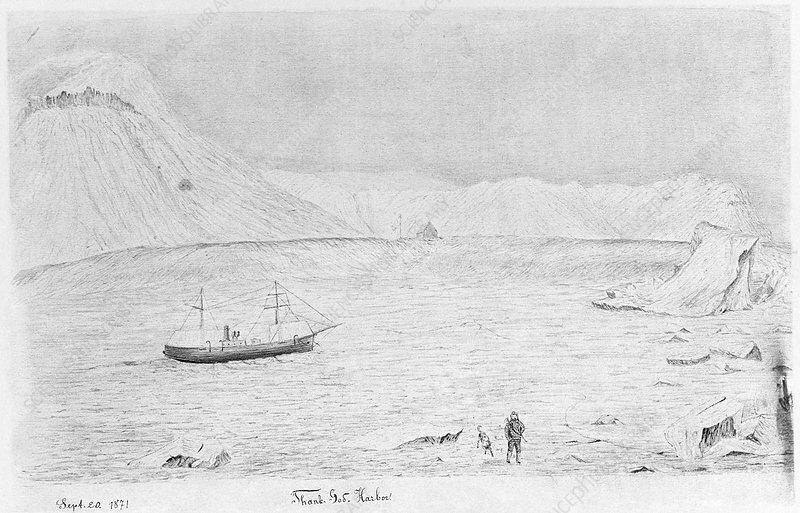 Sketch of the USS Polaris in Thank God Harbour (now Hall Bay), Greenland, drawn by Polaris Engineer Emil Schumann. The US government-sponsored Polaris expedition, led by Charles Francis Hall, set sail from New York for the North Pole in 1871. The expedition did not reach the North Pole, but Hall did go further north than any man had previously been. Shortly after his furthest sledging expedition however, Hall became ill, possibly due to arsenic poisoning, and died in November 1871. A further attempt at the North Pole was made in June 1872, but abandoned. On the return journey to the US, Polaris got caught in an ice pack and was eventually crushed.